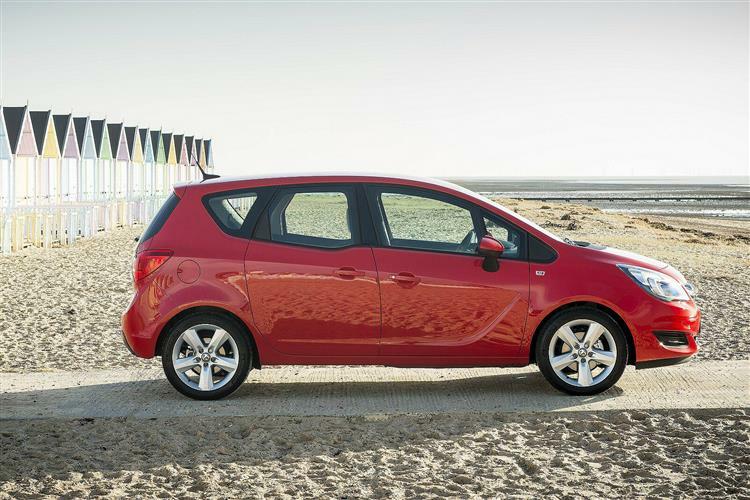 In improved post-2014-era second generation guise, Vauxhall's little Meriva people carrier turned out to be smarter and more efficient, with the option of impressive 1.6-litre diesel power at the top of the range. Its primary selling points though, remained much as before. So the clever FlexDoor arrangement that'll make life a bit easier for parents on the go remained, plus buyers got a range of neat interior flexibility touches that should also make quite a difference in day-to-day living. Overall, it's a people-friendly choice that could be perfect for small families. Family cars ought to be designed for families. Here's a car we reckon you could very easily live with as a used buy - the much improved version of Vauxhall's second generation Meriva compact MPV that the brand launched in 2014. We sometimes wonder if many of those responsible for creating some of today's best sellers have been anywhere near a typical family with squabbling kids and a need to organise snacks and bags, dogs and child seats. It's a hassle and parents need a compact, affordable car to make it easier. A car perhaps, like this Meriva. The first MK1 version of this Vauxhall, launched in 2003, was a supermini-MPV, the very smallest kind, and though it tried its best to be versatile, ultimate lack of size told against it for many. This MK2 version, originally introduced in 2010, was bit bigger - not Scenic or C-MAX-sized but large enough to create a viable, more flexible alternative to a Astra or Focus-sized family hatchback. There are only five-seats of course - it isn't that big - but the space you do get is very cleverly used and impressively accessible thanks to a novelty, the 'FlexDoors'. 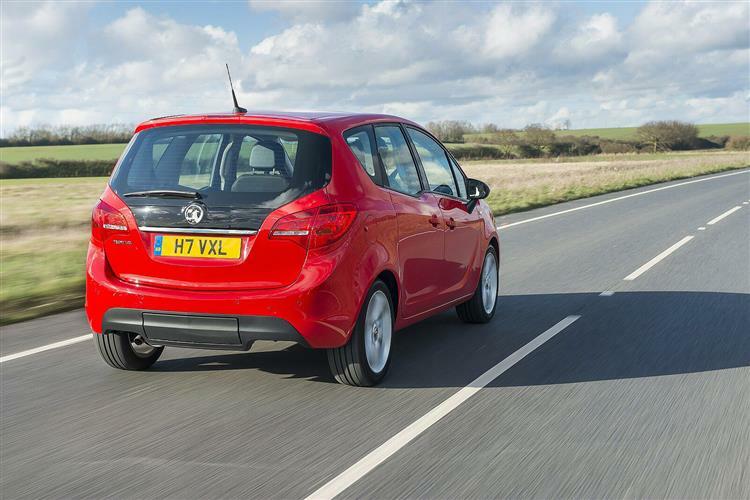 They certainly make getting in and out a lot easier, but Vauxhall was always keen to remind us that this car was about more than just its doors. To emphasise the point, they introduced a substantially updated version of this second generation model in the Spring of 2014 with smarter looks, extra equipment options and a more efficient Euro 6 engine range that included the segment's most impressive diesel option, a whisper-quiet 1.6-litre CDTi unit. It's the car we're going to look at here as a used buy and it sold until mid-2018. Vauxhall reckons it invented the compact MPV segment when the original first generation version of this Meriva was launched back in 2003. Prior to that point, if you wanted a small People Carrier, you pretty much had to have a converted van. The issue though, was in the definition of the word 'small'. Though General Motors' Opel and Vauxhall brands shifted over a million MK1 Merivas, sales were ultimately limited by the car's diminutive size. So this second generation version, first launched in 2010, was designed to be usefully bigger. Not quite Scenic-sized and certainly not large enough to take more than five people but, at 4.28-metres in length, needing pretty much the same size of garage required for a supposedly much larger MK2 Vauxhall Zafira MPV. For all that, this car's natural competitors from its era are still supermini-based People Carriers like Ford's B-MAX, Fiat's 500L and Nissan's second generation Note, all of which by 2015 were more modern arrivals in this sector. Hence the need for the various updates which in that year aimed to keep this facelifted MK2 Meriva in segment contention. So buyers got a smarter front grille flanked by sleeker 'eagle-eye' headlamps. Plus, customers could have the option of LED illumination for front daytime running lights and rear lamps, plus there was a bit of extra chrome adorning plusher variants. Otherwise, this second generation design was in this improved form little changed, with its wavy beltline and distinctive centre side windowline kink retained from before, there to give younger folk a better view out in a bid to reduce the likelihood of travel sickness. The real innovation with this car continued to be its novel FlexDoors - of the kind used by landmark Vauxhalls from pre-war years like the 1923 30-98 model or the 1934 Light Six saloon. Tug the front door handle and everything functions as normal. The rear door though, is hinged on its rear edge and opens in the opposite direction, in the manner of a MK1 MINI Clubman or a Mazda RX-8 - except that crucially, the rear doors on those cars can't be opened independently, a major family drawback. Here, thanks to the use of a central B-pillar, you can do just that, functionality matched only by a Rolls Royce Phantom or Ghost. A self-locking device activates over 2mph, overcoming any safety objections. This layout doesn't of course help you when you're battling within the confines of a tight supermarket parking space - which is where the alternative sliding layout of a rival Ford B-MAX scores. Where you do feel the benefit of the FlexDoor design though, is when entering and exiting the vehicle in more normal circumstances, as the doors open to an angle of almost 90 degrees and you can step straight out unhindered. When both doors are open, the wardrobe door-like layout creates a natural parent-friendly zone for corralling children when they're near to the car. It also helps parents when they're strapping the kids in or fitting child car seats because there's no door in the way to manoeuvre around. Once you're installed in the back, you'll find that space for three people would be as tight as you'd expect it would be on this class of car, though three kids will be quite happy. The seats slide backwards and forwards as they always have done on Merivas, allowing you to prioritise either legroom or luggage space. In their rearmost position, they get even cleverer. You can fold down the narrower centre seat and slide the two outer ones closer to each other, creating a four-seater car with so much shoulder room that you have to stretch a bit to get to the 1.0-litre bottle holders in the doors. And luggage space? Well, lift the tailgate and there's 397-litres on offer, assuming you take advantage of the way that the removable boot floor can be lowered for taller loads. Nice touches include storage compartments in the sidewalls, shopping bag hooks and the way the parcel shelf can be slid forward into special slots so that it's out of the way when you don't need it. Original buyers were offered a clever optional Flex-Fix integrated rear cycle carrier that slides out from beneath the rear bumper and can take a couple of bikes. 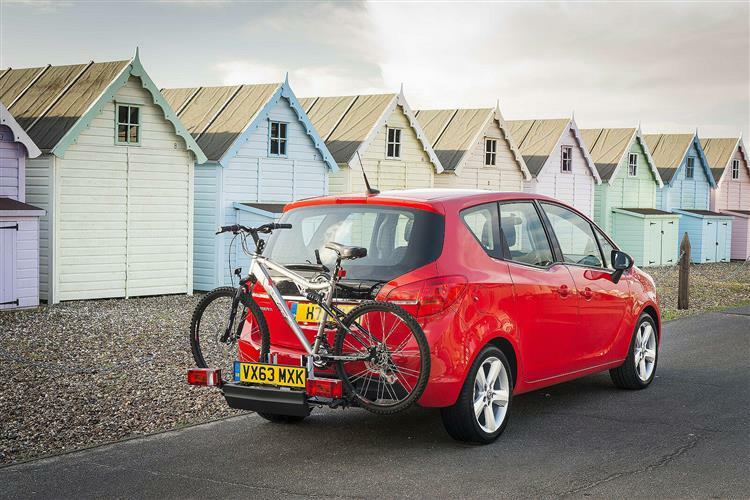 For smaller cycles you might want to stow inside and other large items, the rear bench folds nearly flat for a potential total of up to 916-litres of space up to window level - or as much as 1496-litres of cargo room if you load up to the roof. That's about the same as you get in a rival Citroen C3 Picasso, but is better than anything else you'll find in this segment outside of a converted van. At the wheel, the driving position's surprisingly commanding and the large glass area makes everything feel airy and spacious, particularly if you've gone for a top model fitted with a huge panoramic glass sunroof. You don't get the kind of integrated touchscreen dashboard you'd find in, say, the brand's larger Insignia and Zafira Tourer models from this era but much of the same IntelliLink infotainment technology could be ordered by original buyers as an option, so you might still find it in a used example of this model.. Storage is obviously key on a car like this and cubbies and trays abound, with plusher models getting a storage box under the driver's seat, door pockets able to swallow a 1.5-litre bottle of drink and dedicated spots for bottles, tissues, sunglasses and MP3 players. There's also a large glovebox with a space-saving pocket for the owner's manual, as well as built-in coin and pen-holders. And a mini glovebox on the driver's side that's big enough to hold a wallet, a mobile phone and other items. Most interesting though, is the way that installing an automatic parking brake freed up space for a clever 'FlexRail' modular storage system between the front seats, various aspects of which are either standard or optional depending on the trim level your chosen Meriva happens to have. Get all the aspects and you get yourself a modular, highly adaptable three-tier storage system. Two longitudinal rails, smartly crafted in polished aluminium, have tracks on their inner face. The top track carries a flip-top armrest/storage module big enough to carry CDs, while the lower track carries a storage tray with a cupholder. For convenience, both units slide to any position along the tracks and the armrest module can overlap the tray. Either or both can be easily removed as required using a simple push button if you want to put in a handbag or something. Below the FlexRail, the fixed, floor-level ray that even basic Meriva variants get has twin cupholders and two useful recesses, plus an aux-in connection, a USB port and 12volt sockets. There's even ambient light provided between the rails for convenient use at night. Neat. We found plenty of satisfied post-2014-era Meriva customers, but inevitably, there were some who had issues. There were lots of reports of assorted squeaks and rattles, so check for these on your test drive. In one case, an electric fault caused a loss of steering. On that subject, you'll need to make sure all the electrics work, because we've come across several reported problems, most of which were fixed speedily under warranty. Older diesels sometimes have problems with their diesel particulate filters clogging. One owner had a steering rack replaced and another found his starter motor catching fire. One owner had a fuel system issue; another had a fuel gauge fault and had a leaking drain pipe on the oil sump. We had a report of a head gasket failure. Other than that, it's just the usual things. Check the alloys carefully for parking scrapes. And examine the interior plastics for signs of general child abuse. (approx based on a 2015 Meriva 1.4 petrol - Ex Vat) An air filter costs around £11-£23. An oil filter is in the £6-£8 bracket. Front brake discs cost in the £60 to £70 bracket. Rear brake discs cost in the £28 to £62 bracket. Front brake pads sit in the £20 to £54 bracket for a set. A set of rear pads is around £13-£31. Front brake callipers are around £53, while rear callipers are around £88. A clutch kit can cost £77-£88. A radiator can be had for around £155. An ignition coil costs in the £126 bracket. Though, unlike the original MK1 model Meriva, this second generation model never bothered with a manic VXR performance model, the news that virtually every variant in this car's line-up features a turbocharger might lead you to expect more performance across the board than is actually on offer. Actually, the turbo approach in this case is less about speed and more about efficiency. And no variant in the line-up sums that approach up better than the 1.6-litre CDTi. 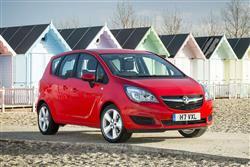 Vauxhall calls this its 'Whisper Diesel' and it was the major change with the improved post-2014 model line-up. Sure enough, refinement is far better than was provided by the rumbly old 1.7-litre powerplant that following the facelift initially continued on for a short period for those in search of automatic transmission, though to be fair, that's not saying very much. The 'whispering' 1.6 was offered in two guises - the 110PS version most will buy and the 136PS model we'd prefer. We've always struggled to recommend the company's diesel models from this era, but this one's different, quiet and free of vibration and eager to pull from right down low in the rev range for effortless progress. The 110PS variant isn't especially fleet - expect to reach 62mph from rest in around 13s en route to a top speed of just over 110mph - but the 136PS version is quite as rapid as any car of this kind needs to be, its useful 320Nm of torque improving that showing to 9.9s and 122mph. All of which is all very well if your budget will stretch towards the top of the range. If it won't and you want a diesel in this car, then you'll find yourself instead agonising between 75 or 95PS versions of Vauxhall's trusty but aging Euro 5 1.3-litre CDTi unit, the pokier variant being the one to have. That's not only because its rest to 62mph figure of 13.8s is over three seconds faster but also because it comes with the full suite of the brand's ecoFLEX efficiency tweaks. Most buyers though, will probably end up behind the wheel of one of the more affordable 1.4-litre petrol-powered Merivas. The determinedly budget-conscious can have this unit in normally aspirated 100PS guise, where 62mph is 14s away en route to 110mph. Better though, to stretch further and get this engine in the 120PS turbocharged form most will choose. Here, the stats improve to 11.3s and 117mph - which isn't far off the 10.1s and 122mph showing of the top 140PS model. You won't be too bothered about how much can be gained by flinging this car around the bends, though the suspension tweaks made to this revised model did make it a little more responsive through the turns. 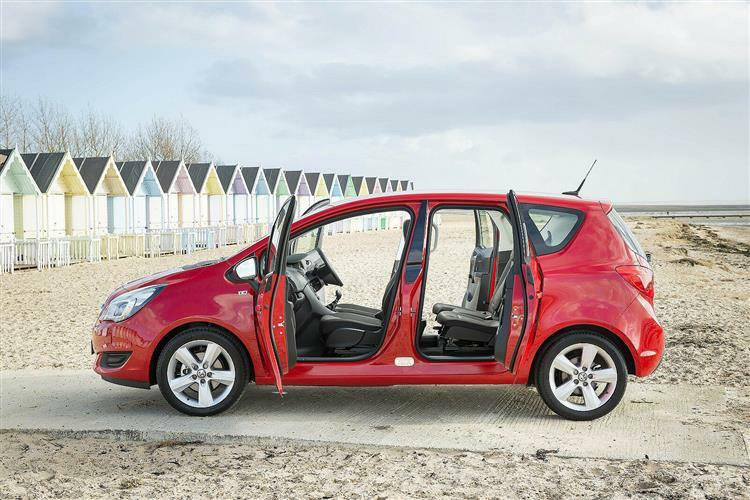 For most potential buyers, a greater priority though will be the need to reduce journey sickness by keeping bodyroll in check, one reason for this Meriva's firm but comfortable ride, allowing for excellent chassis control around corners. Grip and steering feel are both excellent, the latter having been tuned specifically to the needs of British drivers. The 6-speed gearbox is notably slicker than before too. A pity though, that Vauxhall wasn't able to do anything about the lengthy 11.5m turning circle. 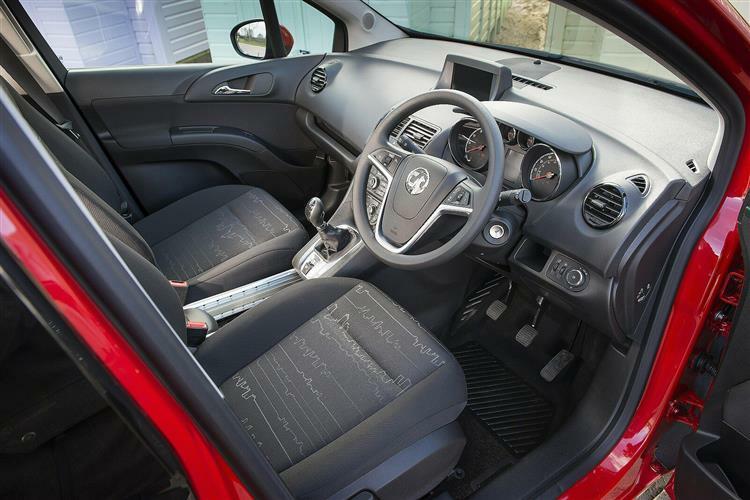 As for refinement, well it could be better at higher speeds but when you're commuting or doing the school run, this Vauxhall should prove a comfortable companion. You could be forgiven for wondering about the point of buying a five-seat MPV based on a very compact hatchback. After all, why would you buy a small car when you need all the space you can get? 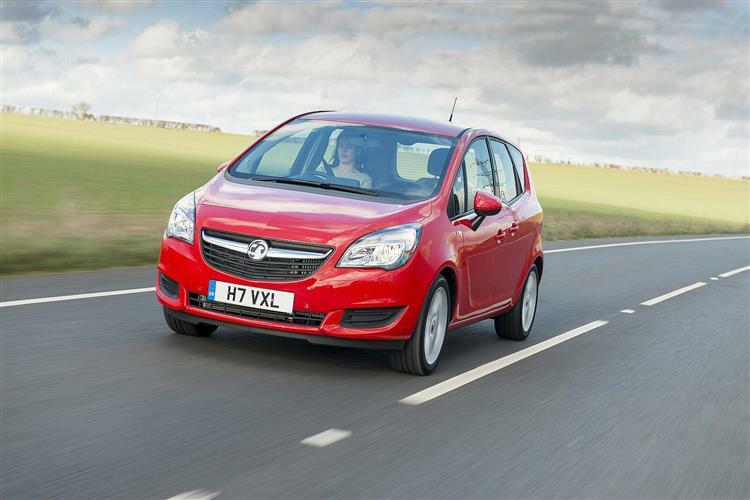 This improved second generation Meriva is very good at answering that question. It isn't quite as pricey as a C-MAX or Scenic-style Focus-sized MPV from its era, yet offers most of the roominess and versatility you get from cars in that segment. In some ways indeed, it's even more flexible. We're referencing of course of the thing that really marks this car out - its clever FlexDoors. And they do certainly make family life a bit easier. But there are also other reasons why you might want to stick this car on your shopping list. The supportive seats and IntelliLink infotainment system are both buying incentives. For us though, the chief one, if your budget will stretch to it, is the 1.6-litre CDTi diesel engine that arrived with the MK2 model facelift. It's the best diesel in this segment from this era - and when installed, makes this one of the few really small MPVs from this period that's properly suitable for regular longer distance trips. Get the right deal and, providing you're not looking for sterling petrol economy or the kind of dynamic handling really irrelevant to most buyers in this segment, there's little else not to like about this car. It offers little touches that you'll miss when you have to do without them, not least its double-opening party-piece: without doubt, this Vauxhall scores on the doors.